1. How does it affect ship balancing if suddenly all are the same regarding total aux potential? I feel this might have a negative impact on ship diversity. The people who enjoy handling instable cores to squeeze out the last bit of power are out of business. I think I do get your idea though. After implementing the upgrade function the cores can improve faster and you feared the aux settings would have no importance anymore. But they are important even in late game due to the Aux Power Talent, that ensured that even high level ships could get substantial energy boosts from sensible aux power settings. Also the old values already made a big difference on level 1 ships. I join random open games very often. I think I have a good grasp of the play styles on EU and US servers. I can assure you even after the upgrade function was implemented, people still invested lots of thoughts in aux settings. From beginning to the end. There is/was the default setting that nearly every ship I flew on used: Everything off but oxygen, cyberdefense and interior lights. Some people also kept missile lock on or turned it on when needed. Also advanced engineers had slightly different aux settings for different combat/exploration/racing situations. With 19.4 I predict the following setting will dominate from now on: Everything off aside of cyber defense and lights. Or all off, since cyber attacks are quite uncommon and light can be substituted by headlights. And missiles are not that powerful in mid and late game, especially with science now being able to direct main turret damage to specific parts of the enemy ship. This change makes them even more impractical because 3k MW are more useful then missiles in my book in many game situations. People will wear suits or make Sylvassi/Robot crews since oxy off is a massive advantage now. This update pushes just towards "turn it all off and accept the inconveniences since the gain is worth it now" powergaming. This is why everybody but the worst tryhards kept the interior lights on before: Because the gain was not worth the inconvenience and loss of immersion. The changes will not lead to people giving it more thoughts what to shut off, they already did that, it will change the answer to that question to a quick "Everything!" since this IS the most sensible setting now. 3. 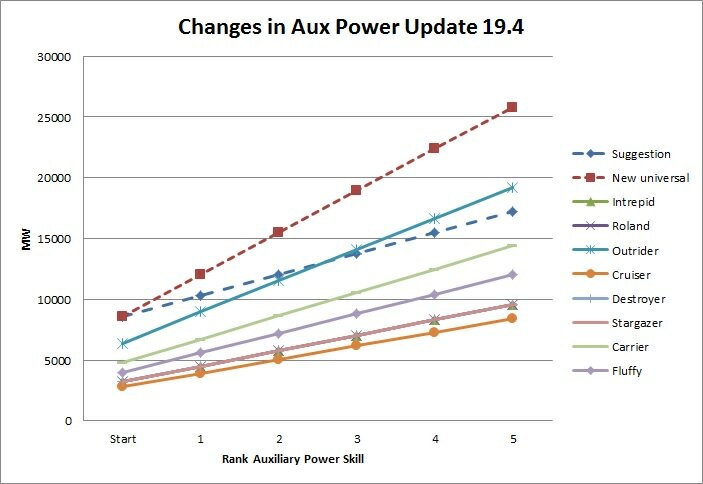 I added a suggestion of 20% per aux power talent rank to the chart (dark blue dotted line). If it has to be like this, then a massive talent nerf is the only way to keep engineers useful. Only the outrider will then suffer from less aux power in mid- and lategame then compared to before 19.4. Edit: I see you already addressed some of my concerns in 19.5. The chart for your implemented 10% aux power thing would place a nearly horizontal-looking line, ending slightly above the Fluffy's last dot. I think this might be too much of a nerf. 15% would end slightly above the last dot of the Intrepid. 20% and 15% both look like ok options to me. Btw. I assumed you add % of base value in my charts.